‘Curiouser and Curiouser’ said Alice, and if you are curious about Kent produce that finds itself served at the top tables in the world, then join us as we find out about a local brewing and wine growing success story in two parts. Part 1: The Curious Brewery and its state of the art building (opens April) will welcome you on a morning guided tour where you will find out about techniques and the art of brewing and enjoy tastings. After an optional lunch in its new restaurant (Menu and prices out soon) for Part 2: we will whisk you to the Chapel Down Vineyard where you go behind the scenes with a guided tour of the vineyards and winery together with a tutored tasting of their award-winning wines. 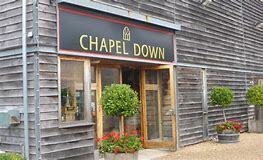 Chapel Down is located in the beautiful Kent countryside, close to the picturesque market town of Tenterden, and set amongst 22 acres of vineyards, recognised as an ‘Area of Outstanding Natural Beauty’, the Chapel Down winery has excellent facilities and you can also explore the grounds, the beautiful herb garden and enjoy a complimentary vineyard walk.